An evolutionary concept in Cancun, the 384-room Temptation Resort Spa welcomes new and returning guests, to experience a contemporary take on the all-inclusive holiday. A hip vibe is the hallmark of this beachfront, euro-style resort where a fun, vibrating atmosphere gets you totally invigorated and relaxed. Tan on the white sandy beach, play in the pristine waters of the Caribbean, or socialize at one of the three spectacular swimming pools, that are themed with different concepts: relaxation, sports and sensual entertainment, include whirlpools and their own swim-up bars. Temptation's exquisitely decorated accommodations feature two categories - Deluxe Rooms and Jacuzzi Suites - all of them include private terraces or balconies that provide an ideal spot for a well-needed rest or even a delightful rendez-vous. Gourmet lovers will enjoy new, gastronomic highs with five dining options that include four specialty, à la carte restaurants and two venues offering world class buffets. A variety of selected premium liquors, as well as an extensive, martini menu and exotic cocktails are available in our six bars. Guests can choose whether to lead the excitement or just sit back and watch. The spa, a haven of pampering, along with other intimate spots, provide them with the opportunity to relax and get away from crowds. Temptation's cast members lead the charge each day with fun, sensual and adventurous activities from water and beach sports, pool games to contests filled with temptations to warm even the iciest contestants. A variety of nightly activities and entertainment sets the mood for staying up late. Temptation Resort Spa is the perfect place for you to discover unlimited options to unwind and enjoy the most memorable vacation in Cancun. Reservation Agents are standing by to assist you! Select your arrival date by clicking on the "Calendar" image above. Then select the number of nights you wish to stay. 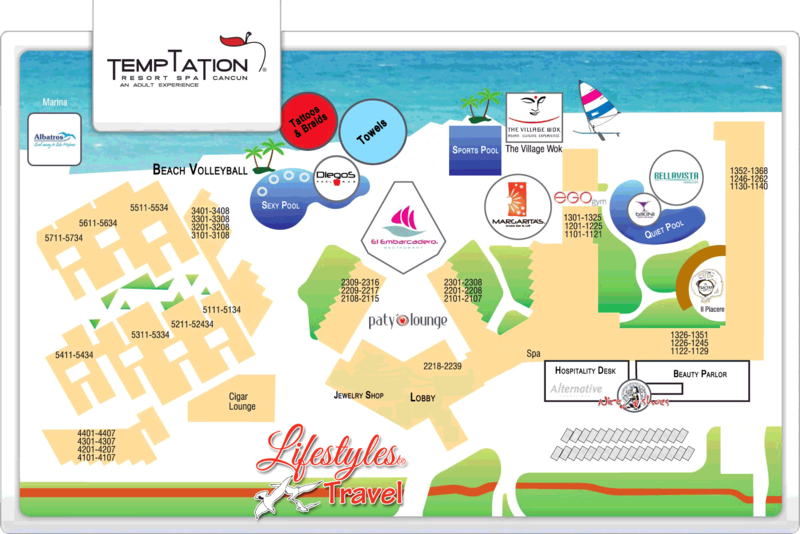 Temptation Resort Spa Cancun © Copyright 2019 LifestylesTravel.com. All Rights Reserved.